I love to come to your home (or you can come to mine) and teach you Indian cooking, whether it’s just you and me alone, with your family, or with your friends who also want to learn. It’s a fun day for all, that ends with a delicious meal! All you have to do is contact me, gather a group and we will organize a class! Students receive step by step recipes so that they can recreate the dishes on their own. Classes are thoughtfully designed to give students a fun, educational, hands-on experience of authentic Indian cooking from various regions. Students learn special techniques and build confidence by participating in the preparation of meals sure to surprise and delight. This is Indian cooking like you might find in someone’s home in India. Every dish with it’s unique flavorings and menus that are interesting and diverse. We talk about the different spices, learn alternatives for spices you may not be able to find locally, and even talk about health benefits of the various spices. Examples of types of dishes taught include vegetables, rice, flat bread, snacks, chutneys, side dishes, desserts, beverages. Each student receives copies of all recipes made in the class. Classes are relaxed yet productive providing an opportunity to ask questions, gain confidence, learn about an exquisite cuisine and make friends. Contact me for details and to arrange your class. That was so delicious! Thank you for sharing the sensual delights of Indian cooking! This was such a lovely and informative experience! I feel like I can go home and successfully start cooking like this! Thanks for the class! It was awesome. I truly enjoyed the experience, we all worked really well as a team and the result was amazing. Thank you so much. We love you. Thanks Robin for a great class and spectacular Punjabi food! A great group dynamic and successful teamwork. Congratulations! I came form Newfoundland to attend Robin's class on Punjabi cooking. A great class, well worth the trip. Thank you so much for the awesome class in Punjabi Cuisine. As always, your food is excellent. Robin Rainbow Gate makes the most authentic and delicious meals! Our lunch for 12 was complete success. Everything was fresh, delicious and beautifully presented. She is one of Tepoztlan's treasures. Cooking with Robin was like being transported into a mother's kitchen, only in India! The aromas where distinctly exotic to me and filled the house, creating a enormous craving to commence our meal. Robin told stories related to the recipes we cooked as she stirred the milk and vinegar to make paneer and trimmed the lamb, melted the ghee and toasted the spices. We floated on her memories of cooking to a far away place as she taught us how to achieve a complete and authentic Indian meal on our own with ingredients found in the Mexican market near by. Robin also prepared a lovely basket with little glass jars of homemade masala and chai. I felt so inspired that we got to relive the flavors with her prepared masalas and carefully written instructions as we later prepared the meals a second and third time. 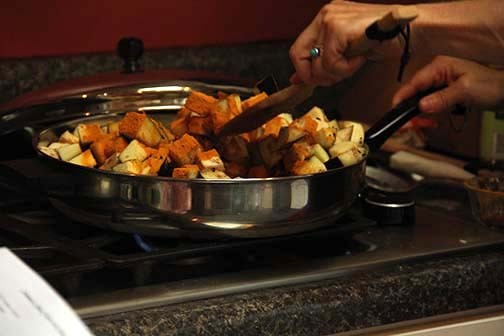 Robin was generous with her time and very knowledgeable as she lived in India and learned directly through being in her friend's and family's kitchens where she picked up the nuances of flavor mixing that are passed from mother to daughter. Robin also is very conscious of nutritional balance and is happy to share this helpful information. After we finished cooking a three course meal, we sat down to savor the sag paneer, lamb curry, rice and finished with a delicate desert. The experience was a journey for the senses and one that I fondly remember as I follow Robin's instruction and relive the stories in my kitchen. Thank you Robin for all the planning and preparation that went into another successful Indian cooking class by Robin Rainbow Gate. The samosas and chutneys turned out delicious and I really feel like I can go home and do this on my own now. Thank you very much for the recipes! We enjoyed the class, the company and, of course, the extraordinary food! I had a wonderful time! I found it very informative and quite fun. I have very much enjoyed Robin’s cooking class. I love the food we’ve shared and cooked together! Robin covered the use of many herbs and spices in her meals…the clases were well planned and organized. I found your class very informative and interesting. I learned a lot about different spices and the interactions between them. I was also interested in the medicinal properties of some spices and how they are used as a health treatment. You are a good instructor – you keep your class interested by allowing us to participate in the preparation of the dishes. WOW!!!! Thank you so much..the food was absolutely divine!!!! I was literally grinning from ear to ear after eating...the sign of great food!! What a beautiful gift you have!! I will definitely be back again for more!! I have no doubt that your food has an avid following!! Thank you for allowing me to be a part of your wonderful authentic Indian meal! After dinner I felt so very balanced and nourished. I truly felt the love and beautiful, healing energy that went into preparing and blessing the food. It is always a pleasure to discover through the palate the extraordinary combination of flavours that your food brings to our mouths! Thank you for cooking with such love, care and passion dear Robin! Thank you so much for offering this class! I have learned a lot today about Indian cooking, from preparation, to spices, and the cooking process. Everything was delicious. I've also met some new friends! What fun! Thank you again. Thank you for a delightful day of learning and delicious dining. Thank you so very much for sharing your home, experience, story and food with us today. It was an incredible experience! Your story is inspiring. I feel ready to start cooking Indian food myself! A lovely spot. Lovely energy, calm tranquil. A place for one's soul to rest, breath, re-energize. Thank you for creating a workshop to feed body, mind and spirit. Robin, thank you very much. Everything was delicious again and we had a great time with you....and your home is so peaceful and beautiful. Looking forward to the next class. Thank you for all your advice and help. Your skills are a marvel. Everything was splendid and most enjoyable. Let's repeat soon. Great class! We really enjoyed the whole process - the orientation, the rotating cooking stations, and then eating a truly delicious meal with complex and complementary flavors. Well done and thank you! Excellent experience with the Punjabi food. I could travel with the flavor and the smell to the north of India. The eggplant was amazing in my mouth. What a wonderful feast for the senses; from the moment we arrived. Your home, the colours, the aromas - all held in this corner of the world by those majestic mountains. What a joy, what a privilege. Thank you so very much for sharing your home and cooking talent with us.